You know that brand that has been around for ages and has always seemed to be a bit like Ribena…but different! 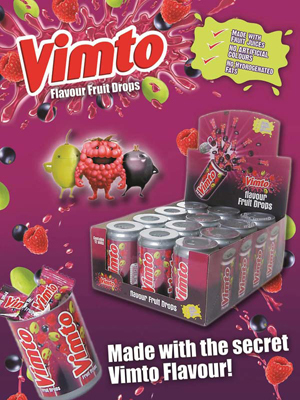 No longer happy to follow, Vimto’s new launch is likely to shake up the ambient fruit drink category and blow the minds of the confectionery guys too! The selection of individually wrapped fruit drops made with real fruit juice gives the Vimto experience in sweet snacking. The pack format also seems to be taking cues from the drinks category by launching in a can giving a total brand experience and one that is definitely rooted in its soft drink heritage!